Ickle Bubba Globe Prime Pushchair is a perfect choice for parents who want to pull out all the stops! With a stylish rose gold chassis, this all round pushchair offers comfort and convenience, and is suitable from birth to 15kg. 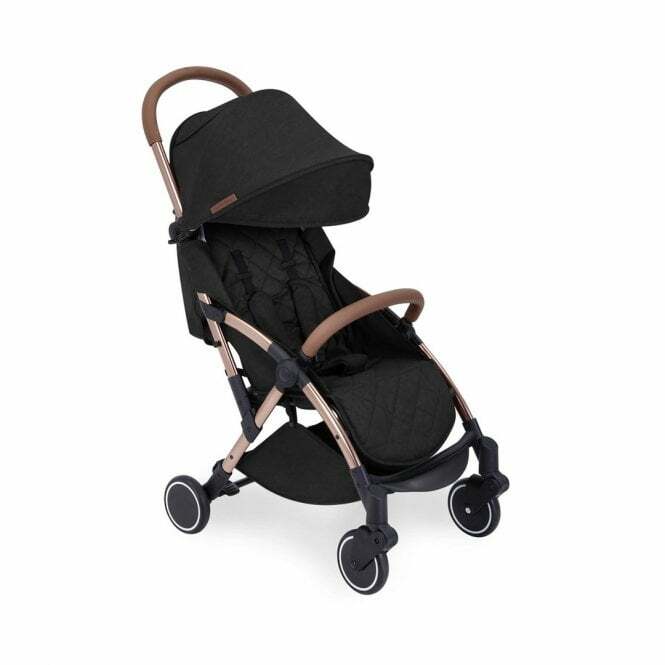 Why should I choose the Ickle Bubba Globe Prime Pushchair - Black? The Ickle Bubba Globe Prime Pushchair is a lightweight pushchair that you will want to show off! This pushchair comes equipped with a rain cover and luxury soft quilted seat liner and footmuff. That's not all, it also includes a cup holder, buggy organiser, and a protective storage bag. Talk about giving you everything you need! Ickle Bubba help to keep your valuables within easy reach, offering multitudes of easily accessible storage pockets for yours and baby's supplies. Suitable from birth to 15kg, the Globe Prime Pushchair from Ickle Bubba is ultra compact when folded at a mere 45 x 55 x 25cm. This is fantastic for those with little storage space. Plus, it can also fit in the overhead luggage compartment of some airlines - what a catch! A lightweight pushchair with a rose gold aluminium chassis of just 6.4kg, you can easily transport this piece of kit around town. It's even easier to transport with the added carry strap and leather shoulder pad. The Globe Prime is travel system compatible, so you can clip compatible car seats onto the frame in one click. Creating a pushchair travel system means that you can easily transport baby from car to pushchair in just a few swift movements. Shh - don't wake baby! The sun canopy of the Globe Prime Pushchair is large and extendable. It offers a UPF of 50+ which protects your little munchkin from those harmful sun rays, and also shelters them from the wind! The hood also features a viewing window, which is fantastic for keeping an eye on your little one without any disturbances. If it is too hot, then fear not. This all round pushchair includes roll up fabrics which helps keep baby cool in warmer weather conditions. Plus, the included protective rain cover helps to keep baby dry once the clouds come in and the rain starts to pour! If baby wants to lay back for a nap, then you're well equipped. The Ickle Bubba Globe Prime Pushchair features a one handed 3-position seat recline feature which means baby can pick their comfiest position. You can even adjust the leg rest so that they're at optimal comfort! Perhaps you're going over some bumpy terrain and are worried you'll wake baby? Don't worry, this pushchair includes front and rear suspension for an even smoother ride. To manoeuvre your little one in and out of this pushchair, Ickle Bubba have included a gate opening bumper bar for incredibly easy access. The bumper bar and handle bar co-ordinate in a stylish tan leatherette for even more style and comfort - winner! What are the specifications for the Ickle Bubba Globe Prime Pushchair - Black? Includes: Globe Prime Pushchair, seat liner and footmuff, cup holder, buggy organiser, protective storage bag, rain cover, user guide. Is there a Manufacturers Warranty for the Ickle Bubba Globe Prime Pushchair - Black? Ickle Bubba offer a 1 year Manufacturers Warranty from the initial date of sale. Register your product and find out more information over at www.icklebubba.com. Applies to UK mainland only.